Jane is very shocked and says she'll have to think about it. Mark says he knows what he wants and he's going for it. Jane asks him to hang on to the ring until she makes up her mind. 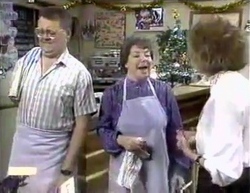 Madge wishes that Scott and Charlene could be with them for Christmas. 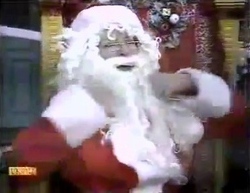 Harold suggests a long telephone conversation with them on Christmas Day, and he'll ring David too. He wishes he knew where Kerry and the baby were living so he could send them presents. He doesn't even know if the grandchild is a boy or a girl. 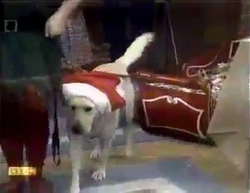 Harold is looking forward to being Santa Claus at Lassiter's again though. HAROLD: I'm sure Bronwyn isn't the violent type. HENRY:(darkly) Who knows what any woman's capable of, Harold? Toby and Joe come in chatting amiably. Joe says he can stay up to open a parcel from his mum. Toby rips it open and there's clothes inside. Toby is rather disappointed(!) Joe says it's good clobber and maybe Santa will bring him something better (like a new pair of undies!) They laugh together. Bronwyn and Des are decorating the Christmas tree. Henry has come over to try to make peace, but Bronwyn's clearly still in a strop with him. She tells him that he pulled a stupid stunt by letting her think he was ill. Henry says he's sorry, but Bronwyn must like him because she's so upset. HENRY: Bron, I thought what he had was special, that it was the real thing that would last forever - marriage, kids, the works! BRONWYN: I thought that too. HENRY: Don't throw it away because of some silly misunderstanding. BRONWYN: It's not because of that. It's because you didn't trust me - you thought I was the type to cheat on a fiance. That hurt, Henry - it really hurt. I'm not giving you a chance to hurt me like that again. Jame is dressed up to go to work. Joe is lounging on the sofa. Joe might take Toby to see Santa later, although he's a bit worried about him recognising Harold(!) He starts talking about Mark. JOE: Best catch you're ever likely to get. JOE: Yeah. He asks you to marry him, you say yes. On the spot. JANE: Joe...it just so happens that he did exactly that tonight. Joe is quite chuffed and can't understand why Jane hasn't said yes yet - the bloke is a millionaire! But Jane doesn't want to marry him for his money - she has to be sure that she loves him for himself. JOE: Too much thinking can be dangerous. You should just snap him up, quick as you can! JANE: Don't you think you're being just a little bit mercenary? JOE: Mercenary, me?! No way. Look, how many chances are you going to get like this in a lifetime? The bloke rich, young, good-looking...if you can't love a bloke like that, who can you love? Harold has got a bit of a sore back and is rubbing it. 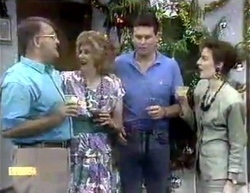 Jim and Madge come to check that Harold is coming to the party later. Sharon is looking forward to it too. Aunt Edie comes out of the kitchen and asks if she can do anything for the party. 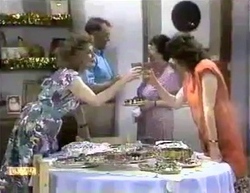 Madge advises her to just bring a plate - they'll all miss Helen's cooking. Madge tells Harold off for wincing - his back isn't good enough to do his stint as Santa. She goes off to speak to Paul. HAROLD: It's not that easy you know. They won't be able to find anyone to replace me - well at least, not somebody who can fit the costume. Jane is discussing Mark's proposal with Gail. GAIL: Well, I guess it all boils down to one thing. Do you love him? JANE: Yeah, I think I do. JANE: Alright, I know I do. He's charming, handsome...everything I'd want in a husband. GAIL: Then what's the problem? JANE: I wish he wasn't so rich! I'm scared I'm going to end up like my mother - more in love with the money than my husband. GAIL: You're not the type, Jane. JANE: And the other thing is, our backgrounds are so different - I mean, he was born with a silver spoon in his mouth, everything he ever wanted on tap for him. She doesn't think it will be easy to get used to - Mark even has servants at his house. Gail says she'll soon settle in and she and Mark will be able to sort out problems together. GAIL: Just don't forget, there are no guarantees in any marriage. JANE: Yeah. I guess every couple takes a risk when they walk down the aisle. Todd and Nick are bringing in the Christmas tree while Lucy gets the decorations ready. Some of the decorations were made by Scott and Paul at primary school. Nice looks a bit sad - they're rather like the decorations his grandmother used to make in the caravan. Lucy assures him that he's part of their family now. Katie comes over looking a bit sad and tells Beverly that instead of wishing for presents she should have wished for Helen to come out of hospital. They reassure her. When Jane has popped to the kitchen, Joe shakes Mark's hand, telling him he's happy about the engagement. JOE: You'll have no trouble getting my permission. Joe reckons that Jane will definitely accept - and not just for the money, Joe reckons Mark is the right sort of bloke for Jane. Jane comes back in with Toby who is wearing the clothes Nolene sent and wonders when she is coming back. Joe doesn't know. Jane tells Toby that he should apologise to Katie for eating garlic before kissing her in the play - she was pretty hurt by it. Toby tries not to laugh. JANE: I think you should say sorry. TOBY: Mmm. Well, I'm not going to kiss her, yuk! 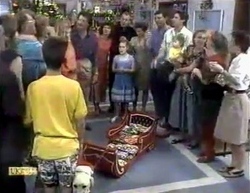 When Joe and Toby have gone, Mark pulls Jane back. MARK: I promise not to say "yuk" if you kiss me. The Christmas party is getting going. Des is telling Gail that he's spent a fortune on presents for Jamie. Gail comments pointedly that she and Paul are on a very tight budget and probably will be for the rest of their lives. Paul asks her to lay off - just for Christmas. 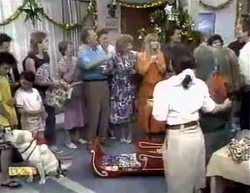 Henry approaches Bronwyn and tries to drag her under the mistletoe, but she's not having any of it. Jane, Joe, toby and Mark arrive. Joe and Aunt Edie glare at each other silently. Toby apologises to Katie. TOBY: I'm sorry I ate garlic before I kissed you. KATIE: That's alright, I'm sorry I hit you in the eye. She jumps on him and kisses him! There are shouts of "Go, Toby!". When Katie releases Toby he is making an awful face. But Katie is oblivious and is grinning from ear to ear as Toby sprints from the room! 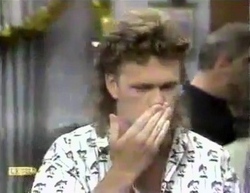 Joe catches up with Toby who is obsessively wiping his mouth. JOE: What did you go rushing off like that? JOE: I know, but she didn't do you any harm. TOBY: It was all wet! Joe explains that one day Toby will enjoy kissing girls. He is skeptical. TOBY: Did you use to like kissing Mum? JOE: Reckon. er...you know, things change. Got married. Too young to understand, mate. TOBY: You said you'd be coming for me soon. JOE: Yeah. After Christmas. Won't be long, I know you're missing her. Suddenly Toby flings himself into Joe's arms. TOBY: I don't want to go! I want to stay with you! Joe is shocked but hugs Toby back. JOE:(emotionally) I don't want you to go either, mate. TOBY: Then let me stay! JOE: It's not that simple. But...we'll see what we can do, eh? Come on, we're missing the party. As they go back into the house, Jane and Mark come out into the garden. MARK: Look, I know I gave you 24 hours, and they're not quite up yet. But I don't think I can stand the suspense much longer. Henry is moping about, but everyone else is having a great time. 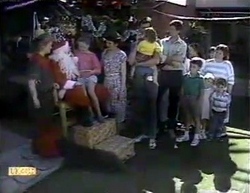 Harold suggests a trip to Queensland to visit Scott and Charlene and Sharon comes in in her pixie costume, with Bouncer, who is wearing a Santa hat and pulling a sleigh. She starts giving out presents. She apologises for pushing Lucy in the pool and they agree to be friends. Jane and Mark come in. MARK: Can we have everyone's attention for a moment please? There is a lot of shushing. 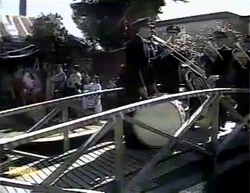 MARK: Well, firstly I'd like to thank all of you for how welcome you've made me feel here. Secondly, I have an announcement to make. Jane has agreed to be my wife! Everyone looks overjoyed for them, all except Des who looks rather gutted. HAROLD: Well, I think this is a very good time to wish everyone a Merry Christmas! MERRY CHRISTMAS! They all start singing "We Wish You A Merry Christmas" (Nick is singing alternative words(!)). Then they all give three cheers and Bouncer barks. And the curtain falls on the 1988 season.